Here’s Day 9 of the St. Anne Novena! My most loving St.Anna i am Urgently requesting for your intersession St. Anna pls. protect my husband and my job our visas to be renewed company to progress management to pay our bills and dependent visas our bosses to be blessed with patience love and understanding my sickness to be cured daughter to pass her FinalYBC friend turned foes to keep distance from troubling us. and most loving st Anna one great imposible for me miracle is required pls. keep our parish priest to be kept in our parish not to get transfered just for one year. a great miracle which i will testify you ASAP pls. touch the hearts of Bishop Camilo B and all the proviences head priest to change their mind and keep our loving bro priest Fr. in bah just for one year I know you will not leave my prayers un answered. I asked St. Anne to pray that my son got a job. I completed the novena and the day following her feast day, my son told his dad he had been offered a job with a good company. Thanks to all of you and especially St. Anne for your intercession! Thank You, Lord for your mercy!!! I shared this novena to a group to pray for a friend who is severely ill. He passed away after recieving d sacraments and died peacefully with the Lord. He kissed his dad and said goodbye. Such a happy death! Praise & thank God! Thank you souch St Anne & St Joachim! Thank you Jesus and Mary! Thank you also for all who prayed with us! God bless us more! I prayed this novena for my future husband. We had a disagreement and i feared he was very sick. I had not heard from him in 3 weeks during which I was praying this novena. At the end of the novena, the very.next day I got a text from him and all is well! I prayed for my sons success at his new business he opened on the first of June. and today on the last day of the novena he got a job that will last a year. Thank you St Anne mother of Mary. I have prayed your novena and ask you to please intercede on my brothets behalf. You know what my intention is and it requites a miracle. For my friends Chris and Julie who were fired yesterday. May God reward their service to him with fulfilling employment. Dear St. Ann, I pray that my boyfriend VM gets a job offer from a company he has talked with recently or any other company in the US, no matter what city. Please, I’m begging you don’t let him leave the US! Please St.Anne let my son Daniel get the job at Kent he was interviewed for on Friday, July 21, 2017. 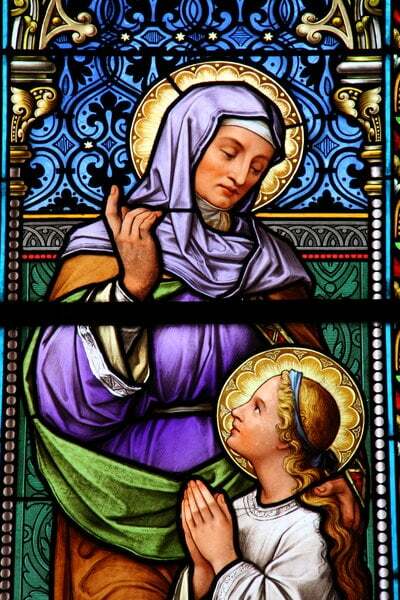 I place my trust in you St. Anne. Thank you St Anne and Joachim for interceding for a marriage threatened by infidelity …. that has seen some positive growth towards healing. Prayers for Charlie Gard and His Family . prayer father god to turn resume to hire, place your favor on the resume to turn into hire, prayer for restored career employment, your blessings stolen, prayer for c to g other comp positions to pay bills, provide favor to pay bills and way for me, running out how to pay bills, dear father god I ask of your favor, mercy and make a way, standing in agreement in Jesus name, amen. Thank you for my blessings and for helping me get a great job that provides work life balance. I ask for your intercession on helping my daughter find a position that is rewarding meaningful and provides work life balance. I ask in Jesus name. I suffer from a stroke please cure me ST ANNE AND ST JOAQUIM.AMEN. Lord I place my financial needs into your hands. Lord I pray for my children. I pray that my children be successful in their exams . I pray for my marriage. I pray for my husband. Prayers for my good friend G to find a job.